Jenna turned 9 on Saturday. Nine! And, in our house, you can’t rightly turn 9 without some kind of a celebration! She decided she wanted to have a Harry Potter Party, so we made invitations that looked like this. When it was party time, the guests arrived at platform 9 3/4 and came inside to be sorted by the sorting hat. I had made a sorting hat out of a paper bag, and then painted it black. To make the sorting hat speak, I taped my cell phone inside the hat so that the sorter (Ryan) could put everyone in the right house. Actually, we only had two houses, Ravenclaw and Huffelpuff. Because Nobody wants to be in Slytherin, and everybody wants to be in Gryffindor, so those two were eliminated, leaving only the neutral houses. When they were put in a house, they received a badge on a string. But really, we didn’t even divide into houses, so it didn’t matter which house they were in, it was just a fun thing to do. And each child got to pick their own wand. Next, we had our potions class. I had some really cool old jars that I filled with all kinds of different juices and sodas, and the kids could choose their potions. They could mix colors if they wanted, and try as many different mixtures as they wanted. Squid dogs, owl droppings, small orbs (grapes), and wizard buscuits (rolls). At the last minute, however, I found out that one of Jenna’s friends has a severe peanut allergy and can’t be around ANYTHING with peanuts, so we nixed the muddy buddies and went with plain Lays chips instead. The kids seemed to enjoy the weird food, although those squid dogs were grossing me out. After they ate, it was time for some wizard games. We played “Hoo’s Hedwig”, which is kind of like Marco Polo without the pool, only the person in the middle (Harry) has to find Hedwig the owl, who is saying Hoo. The other kids can say any other animal noises they want. Then we played a game with silly arms, where one person stands behind another and does the arm movements, while the person in the front answers a question describing some action. Next, we did some creating and the kids got to “Make their own dragon”. I got out whatever craft supplies I could find, like googly eyes, pipe cleaners, foam, popsicle sticks, glue, scissors, etc, and they all just tried to make a dragon. None of their “dragons” were all that great, but it was a nice time filler, and not TOO messy. Then, while Jenna opened up her presents, I was able to clean off the table and get ready for cake. I made this cake all by myself, which is rare. Usually I rely on the talents of those, well…more talented in the art of decorating cakes than myself. But this time I decided to just be brave and do the cake myself. And if it didn’t work, I could always just go and buy a cake from the grocery store and stick the Harry Potter figures on it. I borrowed the book cake pan from a friend, and I was pleased with how it came out. I was going to put the little figures around the cake, but they kept falling over, so we went without. It was a fun party, and most importantly, the birthday girl thoroughly enjoyed it! My computer is back! Hooray, Hooray! Maybe you didn’t even notice it was missing, because I’m such a good faker, but it’s been gone for a couple of days. It hasn’t been far, just in Ryan’s office. But still, out of commission is out of commission. Before that, it had been limping along for a couple of weeks. It freaked out and froze whenever I tried to run windows. Ugh. So my dear husband, as soon as he had some free time, got it working again. Yes, he is amazing. –I made salmon tonight. The kids were not thrilled, but Ryan was. ‘Nuff said. –Friday night we went out on a double date. Fun! I had won some ticket to the Collin and Brad show, and we invited our good friends Tess and David to come with us. And I must say, a good time was had by all. We went to dinner at the Garden Restaurant, then walked over to Abravanel hall for the show. As we were finding our seats, I heard someone call my name. It was Don and Nancy–parents of one of my best friends in high school. I haven’t seen them in at least 10 years, but it was SO fun to chat with them! It was kind of a bonus! The show was fun, I laughed until I cried. They did funny improv sketches. One of the most notable was the mousetrap skit, which goes like this. –I’m making chocolate frogs. Yep. Harry Potter party coming up this weekend, you know. I’ve also made a sorting hat and some wands, and I picked up a bunch of many flavored beans today. Oh, the preparations! –The science project is underway. More on that later. –Today I had to tell my children that they are getting up too early. Yes, you heard me. Too early. I keep hearing children walking around (and I can see that the hall light, which turns on automatically when someone walks around in the hall or stairs, is on) before 5:00am. BEFORE. What the what? I asked Cole how early he’s getting up, exactly, and he said around 5:00 or 5:15. Too early. I ban you all from getting up any earlier than ONE hour before you leave for school. It’s not like they do their hair or anything. Sheesh! This week wasn’t as much fun, in the way of grocery shopping. Since I blew my budget at Costco last Saturday, I didn’t even have any budget to work with this week. I made it to Friday before I had to break down and go to the store. I just made a quick run to Kohlers for bread, milk and produce. They had some of their bakery bread on sale for 50 cents per loaf, though, so I grabbed four loaves. I made it out of there only spending $22. I did cave and go to Walgreens this week, since I had some pictures I needed to print for invitations for Jenna’s upcoming birthday party. I had register rewards to use (free money!) and they had such a screaming deal on Pepsi, I bought a few cases of that. I don’t really count that as my grocery budget, since it’s not really groceries, but maybe I’m cheating. Who knows? I have reached my budget of $100. I’m not done with the month, yet, so I’m pretty sure I will go OVER my goal. But it’s been a good experience. A learning experience. As this challenge winds down, let me share a few things I’ve learned. 1- Even if it’s a great deal, it’s not necessary to buy every item. I tend to overbuy when something is one sale, and then I end up with four cases of granola bars in the basement that may or may not get eaten before they go stale. Do we eat granola bars? Yes. Does that mean I need to buy 100 of them right now? No. 2- The thing we couldn’t live without was milk. While we tried to ration and only drink 2-3 gallons of milk for the week, I don’t want to deprive my kids of the calcium rich goodness of milk. I mixed up some powdered milk, but that doesn’t really taste like fresh milk, so they don’t like it. They do, however, like the morning moo’s strawberry milk. I had a #10 can in the pantry, and the kids really liked that. That was our only can, however. I’m going to have to get some more of that stuff, so that if we DO need to drink powdered milk, it will be something they’ll actually drink. 3-We waste a lot of food around here. Even this month, as I’ve been trying to stretch our food budget and use what we have, I’ve thrown out leftovers and food that’s gone bad. I guess I’m in the habit of making HUGE batches of food, and sometimes it’s too much for our family to eat. I mean, if I’m going to make cookies, or muffins, or a casserole, I might as well make a double, or a triple batch, right? I mean, if I have to get out all the stuff, it’s better to only get it out once and save me some work, right? I think I need to put 1/2 of that big batch of whatever in the freezer right away, instead of serving the whole “pot of soup” to my family for dinner. After they eat it once, they aren’t too keen on eating leftovers in the same week, and then it sits in the fridge and sometimes it gets used, and sometimes it doesn’t. The same goes with buying from Costco. While it may be a great deal to buy 6 heads of romaine lettuce for $3, will we use all of that, or do I end up throwing it out? So, I guess I need to recognize what we have in the fridge, and not overbuy, or overcook. 4- Ham and cheese are very necessary. Kids start to freak out if they can’t have their ham and cheese sandwiches. Seriously. 5-I need to set up a better rotation system with my food storage. I just let the kids go down and pick out cereal if they think we don’t have any “good” cereal in the pantry, but I need to have them “take from the left side” or something like that. I went down today to organize our cereals, and take stock of what we have left. I have 37 boxes of cereal in my food storage (and 10 more in my pantry). And half of them had “best use by” dates of 2009 or earlier. This tells me that we are NOT doing a very good job of rotating the cereal. But I did organize them, and after school today I’ll take the kids down and we can have a little lesson. Take from the left. I also feel like I might need to join a 12 step program for overshoppers. Hello, my name is Paige, and I buy too much cereal. Hi, Paige. 6-I would like to continue this challenge for another month. Seriously. We have a lot more stuff in the freezer and the pantry that need to be used up, and while it might kill me to not use the coupons I’ve been collecting, I think it’s a good experiment. I will continue to buy fresh fruit and vegetables, dairy and some bread, but the staples and meat should come from what we have. Yes, I’m going to have to make an exception for an upcoming birthday party and valentine’s day, but I think I can do it. Yes, we might be eating mystery meat, and yes, I may go completely crazy and fall totally off the wagon, but I’m willing to give it a try. It’s my amazing sense of smell. It’s not a very unique superpower, as I’m sure many of you have experienced bouts of supernose, as I have. I may have already mentioned my extreme dislike of the immitation maple smell that seems to plague me, as well as my talent for sniffing out the one sour towel. 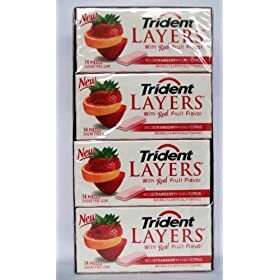 When we went on our recent vacation, I had several packages of this new Trident fruit gum, in both the apple and the strawberry flavors. They laughed at me. Me and my super sense of smell. A day or two into the vacation, Ryan and I went to the grocery store to stock up on some groceries and snacks to last us the rest of the week. As we came out to the car, I could SMELL that dang strawberry smell! “Those kids must have opened another package of that DANG smelly gum!” I ranted just a little. 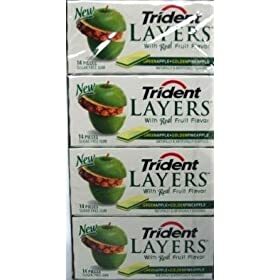 I looked around and couldn’t see any gum. I might have accused or blamed one of the kids. Might have. After we got our expensive groceries, we opened up the back of the suburban and the strawberry smell was OVERPOWERING. What the what? I looked, and there was the 5 pound bag of gummy bears my friend Jenny had sent me for correctly guessing the birth date of her darling baby. She had sent me this huge bag of gummy bears as a prize! Now I don’t want to sound ungrateful for those yummy gummy bears, but they were stinkin’ up the back of my car! Luckily I had bought ziplock bags from the store and was able to divvy up all the bears in smaller portions, and we enjoyed them for a lovely theme park snack. And the smell was contained. So, let’s hear it, what’s YOUR super power? The ability to find that one lost sock? Great parking space finder? Amazing organizer? Juggle things with your toes? Sunday afternoon I suggested that we go to Spanish Fork to visit some grandparents. And wouldn’t it be a good idea to have Cole drive? He needs to get 40 hours of driving in, right? So, we piled everyone in, and Cole got in the driver’s seat. I was right behind him (not as much leg room in the middle seat) and Ryan was in front with him. I was ok until right about the time we got out of our neighborhood. That was when I began to rethink the logic of this here trip. Yes, he had some jerky stops, but in reality he was doing ok. This was not his first time driving. Ryan’s taken him out in the truck (stick shift! Much harder!) multiple times, but it was MY first time riding with him, as well as the first time the whole family has been in the car while he’s been in the driver’s seat. As he maneuvered onto the freeway, however, any last shred of calm I had seemed to vanish out the window. Driving on the freeway is NOT the same as driving around town. Why did I put the entire family in the same car with the teenaged driver? WHY? Even though I was really trying to stay calm, with every lurch or overcorrection, I’m imagining the entire family and how we will look as the firefighters pull us out of the ditch down there off the side of the freeway. I’m not exaggerating here, folks, I really was not handling it well. I tried to keep my gasps to a minimum, because that won’t help the kid in the confidence department. To his credit, Ryan was an excellent driver’s ed “instructor”. He stayed calm and never raised his voice. He occasionally did adjust the wheel, but he didn’t freak out and grab the wheel as I’m almost positive I would do. His voice stayed pretty even as he told Cole to speed up, slow down, stay to the right or left, reminded him to check his blind spot, coast, slow down, etc. I, however, was trying so hard not to scream. I was reminded of MY driver’s ed days, 20 something years ago, with coach what’s his name. It seemed all the drivers ed teachers were overweight wrestling or basketball or football coaches. They would stop at “the SEV” and get a big gulp, and sit in the passenger’s seat without so much as a flinch. I was terrified when he told me to “take it to the freeway”, early one morning, and I remember when he made some comment about my “lead foot”. I was gripping the steering wheel so hard, I didn’t realize my speed was creeping up. Ack! At the time, I didn’t realize that their job really wasn’t the piece of cake I thought it was. Well, at least it wouldn’t be for me. As we approached each off ramp from Pleasant Grove to Spanish Fork, I was SO tempted to cry out, “Get off at this exit and I’ll drive the rest of the way!” I held my tongue and practiced my calm breathing exercises, but I guess I wasn’t fooling anyone. Ryan looked back at me several times and told me to calm down, it would all be ok. Since no one wanted to distract Cole from his important job of driving without killing us all in a fiery crash, there wasn’t much small talk in the back seat to distract me. I looked out the windows at the mountains, but all I seemed to see were the other cars, and how gosh darn CLOSE they were to us. That was the longest drive to grandma’s house EVER. I was never so happy to get there as I was that day. One of the kids asked if Cole was going to be driving home, and I quickly said, “No!” Drive all the way home? In the dark? I don’t think so. Not that I don’t think he could handle it, I just don’t think I could handle it. Was I overreacting? Yes. I was. I know it now, and I knew it at the time. But I couldn’t control my anxiety. Not one little bit. My face had “I need xanex” written all over it. I will leave the driving instruction to Ryan–my calmer half. Perhaps I will need to talk to my mental health professional and get myself some anti anxiety medication before we do that again. If we ever do that again. This challenge is harder than I thought it would be. Even though I know I CAN eat strictly from my pantry and food storage, the hard part is making me DO it. This week Macey’s had captain crunch on sale 5 boxes for $5. I Really REALLY wanted to go and stock up on Captain crunch and granola bars, since that’s a very good price, but I didn’t do it. I also did NOT go to Walgreens, even though I had coupons for items that were on a buy one get one free sale, and I could have stocked up on the cheap. We did have to go and buy some fresh food, though. Here’s what $25 will buy. Actually, as you can see by my receipt, I spent $26. Saturday, however, we encountered a problem. We went to Costco. I know, I know, I said I wasn’t going to go to Costco while doing this challenge, but we were right there, and we needed milk. In total, I spent over $100 at Costco, but that wasn’t all food. 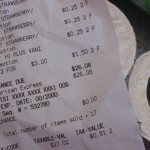 As I add up the actual Groceries from my receipts, I see that I spent $20 on cheese, ham, clementines, bananas and milk. Ugh. But if I count that as this weeks shopping trip, then I’m still within my limit. Saturday night Ryan and I went out on a date, and afterward we had to run to walmart for some paint for our little mudroom improvement project that’s going on. While there, we also picked up birdseed, and I realized we were almost out of bread, so we added two loaves of bread to the cart. Ryan was teasing me about “cheating” and that he was going to add that to the total for me, but I’m coming clean. We also bought some soda, but that was FOR A SCIENCE FAIR PROJECT, not just for drinking, so it doesn’t count. So, there you have it, folks. As long as I don’t spend any money this week (ahem), I’ll still be on track. Of course, I’m planning a birthday party for the end of the month, and I can’t possibly be expected to pull that off without spending additional money, can I? So, we’ll eat from our freezer and pantry this week. I’ve got a turkey in the freezer I’ve got to thaw out so we can cook that on Sunday. Then we can have leftover from that for the whole next week! So, I think we can do it. Emergencies seem to bring out some of the best in people. Our hearts go out to those suffering in Haiti. They are enduring such loss. Loss we cannot even comprehend as we sit in our heated homes on our comfortable sofas with plenty of food to eat, with our families nearby. I’ve been impressed with the way the rest of the world is quick to react with offerings of love, prayers, support, and most importantly, money. There are so many different ways to give, and give we must. Even if all we can give is one dollar, it’s a dollar that will help out in the rescue efforts. How should we donate? “Two planes, one departing from Denver as early as Thursday and another leaving from Miami later this week, will each include over 80,000 pounds of food and emergency resources such as tents, tarps, water filtration bottles and medical supplies donated by the Church. Transportation is being provided by Airline Ambassadors and Food for the Poor will aid with distribution in Haiti. Giving to the Red Cross is another great way to help. And they’ve made it so easy to donate. Just text “haiti” to 90999 to make a $10 donation. It’s been reported that over $3 million has been raised through this text campaign already. Isn’t that amazing. While I was at Costco today, they asked if I would like to donate to the American Red Cross. I did. And it was easy. I didn’t give a LOT, but I did give. And I will continue to give through my fast offerings and other means. Because every donation helps. There are a lot of bloggers who are committed to raising awareness of the need for money in Haiti. They are also committing to raise funds. 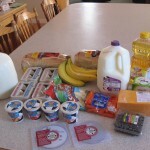 Money Saving Mom is one of my favorite blogs to check for deals and coupons. Now she’s committed to donate $10 for each blogger who donates, writes a post about their donation, and links back to her site. As I’m writing this, there are already 359 bloggers who have linked to her post. On her site she’s listed many other bloggers who are also matching funds, making donations, and really stepping it up for each comment they receive. Won’t you commit to the challenge? Make a donation, blog about it, and then link up to one of these sites. I haven’t included all the links to these blogs (sorry), but if you go to here you’ll be able to click over to each one of those blogs. That will increase the amount of money going to help the people in Haiti. Every little bit helps. Hey my sister just did a great post about our New Year’s Eve party here. Now I don’t have to write about it. My husband bought and installed some upper cabinets for the mudroom. How great is that? It hides the hole from the last project. So, I’m organising the olde mudroom, but that in turn creates piles of mess all over the kitchen, as I try to get the things out of the mudroom that don’t belong. I’ll post pictures when it looks nice. Or when I collapse from exhaustion. Whichever comes first. Hey, do you know what today is? It’s National DeLurking Day. I think I know most of you who do actually read here, but if you by chance are visiting and not ever leaving a comment to say hello, it’s your time to come clean. I’m just sayin. So, have a great day! And if you’ll excuse me, I have to referee the children. One of them seems to be hogging the Wii. It all started the week before Christmas. I was crabby and short tempered and wondered why in the world I would possibly be crabby right before CHRISTMAS! Oh, dang, it must be PMS. I looked at the calendar to see when the last occurrence of my “party” was. Dang. I haven’t been writing these things down for quite some time. I tried to think back to the last time, and I figured out it was just after our vacation to San Diego. That was the end of November, so that would be about right. Darn. I HATE PMS, but the only way to get rid of the PMS is to experience the MS, and that’s no fun, either. Why did it have to be right during Christmas? Oh, well. I resigned myself to the inevitable, and stocked up on diet coke. The chocolate and candy were no problem, since it seemed with every ring of the doorbell some yummy sugar laden goodie was being delivered. Christmas came and went. My period, however, did not. I kept thinking it would be here the next day. Then the next day, and the next. I started to wonder when it was going to come, and there began to be a nagging fear in the back of my mind–what if it didn’t? Every weird smell started to set me off. When I took the kids and cousins to Boondocks the week after Christmas, two of the kids picked out these squishy caterpillar things for their prizes. They smelled like gasoline and plastic. Not kidding. I had to crack the windows on the car on the way home, and I banished those squishy things to the basement. Was I overreacting? I don’t think so. Could this be the beginning of “the big M”? or was it “the big P”? Is there another choice? I started to think about how my life would change if we were to have another baby. For one thing, would it be healthy? I’m 42, now, for crying out loud. And crying out loud is just about what I did. I CAN’T be pregnant. Can !? But we’re so past that stage now. We don’t have kids waking up every three hours, we don’t have any of that STUFF it takes to have a baby. How would we do it? I would have to take a year off of my fabulous bell choir. I would have to “start over” with one more baby. The caboose. Every day, I waited. No period. The Monday after the New Year, I bought a pregnancy test. I waited until Tuesday to take it. I didn’t want to know. But I did want to know. The stress of not knowing was killing me. What would Ryan say? I know what he would say, he’d be thrilled to have another baby. But as a man, he’s not the one who has to go through all the changes, all the work, all the crap–of having a baby. Tuesday, after the kids went to bed, I finally took the test. I read the directions twice, then I peed on the stick. And I waited. I brushed my teeth, and I waited. After the whole three minutes, I looked. That little test could change my life. Would it? Negative. Not pregnant. I exhaled. While a tiny part of me was sad that there would be no baby, I was relieved. Good. I get to keep my life. I like my life. I like the kids and the fun ages they are, and I don’t want to miss all of that by having to focus all the attention on a baby. And I’ve already been blessed with 5 wonderful, healthy children. An embarrassment of riches, really. Relief. I had been going through all those scenarios in my mind, calculating that when this baby is 10, I’ll be 53. When this baby graduates from high school, I will be 60. Sixty! Ack! Both of my sisters are at the moment pregnant, and I wouldn’t want it to seem like I was just jumping on the bandwagon. But if I wasn’t pregnant, where was the period? I waited. And waited. After three more days I wondered if I should take the second test (there are two in the box, you know). I didn’t. I waited. Friday, I finally had some light activity, and I was hopeful. Seriously–hopeful, that it was indeed the start of something. By Sunday, dear Aunt Flo had arrived. And I was indeed relieved. In the coming months, as I get older and closer to the “Big M”, I’m sure this will happen again. I’ll just keep that back-up EPT test in the closet.